Jon and Marion Regan’s family farm is in Kent, The Garden of England. The family has grown soft fruit for more than 120 years on the greensand ridge above the Weald, on the well-drained sunny slopes and the heavier land below. The land is so suited to strawberries that wild ones thrive in the local woods. Marion’s great-grandfather, Bernard Champion, planted his first crop of strawberries here in 1893, to supply the family’s stand, Champion Bros, in the old Covent Garden market. Looking after the landscape and biodiversity means there is a balance between soft fruit under tunnels, arable fields resting in between soft fruit crops, and land managed for wildlife. Hugh Lowe Farms have a Whole Farm Environmental Plan, encompassing conservation, waste management, water management, recycling, energy efficiency and crop protection policies. Tunnels are managed sensitively, and windbreaks and hedges are planted and maintained as screens within the landscape. The farm also supports LEAF, the Kent Wildlife Trust and the RSPB and is accredited to LEAFMarque, the valued environmental standard. Tom Pearson, Farms Director, leads a skilled team of 41 full time local employees and 500 seasonal staff equating to 200 full time equivalent jobs. Berries are grown for flavour and to ensure fresh berries are available from April until November. 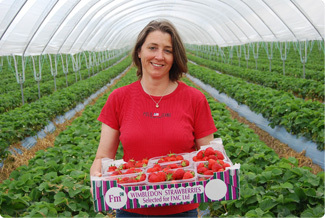 The farm grows the deliciously sweet heart-shaped Driscolls Jubilee, some of the earliest UK crops of Elsanta, and several other strawberry varieties. As for cane fruit, a range of raspberries and blackberries is grown, including Obsidian, Driscolls Maravilla and Margarita. As well as supplying national and local supermarkets, Hugh Lowe Farms berries are available through local farm shops and stalls. Wholesale inquiries are welcomed.